The art world is back in full swing this week. Head to Chelsea this Thursday and meander around the countless openings (and enjoy the cheap, swill chardonnay). Be sure to stop by Joseph Gross Gallery for their opener with Jesse Draxler and Chad Wys. Takashi Murakami’s protege opens a show of her gorgeous embroidery, and performance artist Jill Sigman explores the world of plants and weeds through dance. A group of artists pay tribute to 9/11 with an immersive exhibition called Loft in the Red Zone, and downtown artists and performer Kembra Pfahler joins Howl for their Writer’s Block series. Central Park is getting a brand new giant sculpture inspired by a shopping list thanks to the Public Art Fund, and Bloomingdale’s semi-secret train car restaurant stays open for a special chef’s tasting dinner. Speaking of food, sample all that Greenwich Village has to offer at Washington Square Park’s Taste of the Village event. 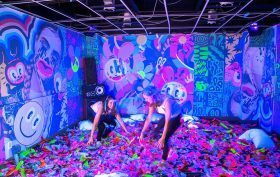 Finally, gather some patience and wait in the long lines to experience Refinery29’s epic 29Rooms, which transforms 80,000 square feet of warehouse space into 29 experiential art installations.